Nebraska Senator Deb Fischer is traveling the state this month, catching up with constituents and hosting Congressional hearings. KVNO spoke with the Congresswoman about the current presidential election cycle. U.S. Senator Deb Fischer is spending her August traversing her home state. KVNO News caught up with the Senator in Lincoln while she was chairing a field hearing of the U.S. Senate Committee on Small Business and Entrepreneurship. In the coming days, KVNO News will report more from the hearing, but we wanted to take the opportunity to ask the Republican Senator what she thought about the current presidential election cycle. Fischer: It’s been an interesting election cycle, hasn’t it? We’ve seen on both sides a different election process this year. Whether it’s with Mr. Trump making some statements out there or with Hillary Clinton saying the FBI Director agreed with her that her emails and her server was not a problem. We know that’s not true. So on both sides we’re seeing, I think, some issues with candidates, some stumbling. It’s a long time until the election. Nebraskans are going to follow this, they’re going to see where candidates are on the issue and then make up their mind and vote in November. Throughout his campaign, Donald Trump has found himself at odds with more than a few GOP leaders. Among other missteps in the last week or so, Mr. Trump criticized the parents of a fallen United States Army Captain on social media, appeared to demand a crying baby be removed from a campaign rally, and according to MSNBC’s Joe Scarborough, Mr. Trump asked repeatedly why the U.S. can’t use nuclear weapons to solve the nation’s problems. Fischer: I support Donald Trump. I know who Hillary Clinton is, again we saw it a couple of days ago she lied. She did it on a Sunday show with regards to her email. So there are issues out there with her honesty. So I think as I said, Nebraskans are going to be watching the candidates, they’re going to see how they align on the issues, and I’ve told people to follow and see where your philosophy is and see how it corresponds to presidential candidate and make your decision in November. 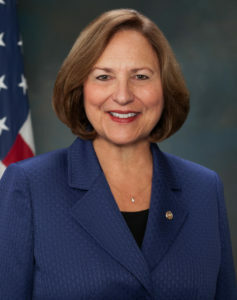 Senator Fischer said she’s spoken with Mr. Trump on two occasions about tax reform, government regulations, and water usage in the U.S. She says Mr. Trump was eager to listen and understood how Nebraskans could be negatively impacted by those things. Thank you Senator Deb Fischer for standing behind mr. Trump. Anyone who goes to the ballot in November and Bolts independent your rights in a candidate may as well just check the box for Hillary Clinton because it’s the same thing. Republicans need to take a lesson from Democrats and stand by their candidate! Thank you so much for speaking up and for taking the time to know what Trump has said. The Bias media is stressful to watch. I spend to much time on twitter posting information to help him get elected and appreciate everyone who helps.